Who doesn’t like a good post-apocalyptic tale? ‘The Postman’, ‘Waterworld’ and ‘I Am Legend’ are among my favourite films. 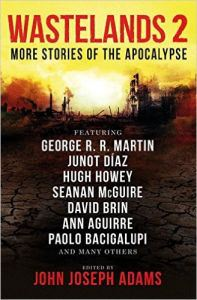 In a short story collection, like ‘Wastelands 2’, there is plenty of opportunity for broad, sweeping adventures, including the original version of David Brin’s ‘The Postman’ as well as shorter, more individual and quirky tales that focus on a specific person or incident or scenario.